With 240 Hz, now even mosquitos can enjoy smooth motion on a screen. That’s because the eyes of said critter only perceive smooth motion past 240 images per second. Us humans meanwhile only need between 22 and 90 Hz depending on contrast and ambient lighting conditions. But jokes aside. At 240 Hz, the image will always be super smooth and fluid, even without G-Sync or Freesync, and without many noticeable sync errors. The niche category of high refresh-rate monitors is starting to fill up. Late last year, the Benq Zowie XL2540 was the first commercially available model with a refresh-rate of 240 Hz. Right on time for the holiday season. 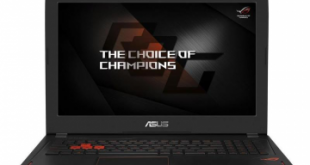 Earlier, the Asus ROG Swift PG258Q had been announced but ended up coming out only a year ago. 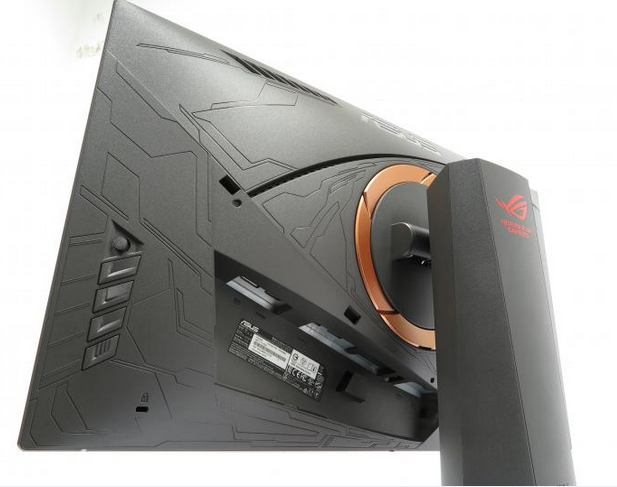 While the Zowie has a fixed refresh-rate, the Asus uses a G-Sync module which can dynamically adjust the refresh-rate between 30 and 240 Hz to match the frame rate of the game. With the Acer Predator XB272bmiprz, another G-Sync monitor has hit the market. While it is already listed, it is said to become available in mid-April. For now, this one is the first 27” model, all the previously mentioned ones have a diagonal of 24,5”. The AOC Agon AG251FZ is currently the only Freesync model available that supports up to 240 Hz. Here, it is also dynamically being adjusted between 48 and 240 Hz. On the outside, the PG258Q doesn’t differ too much from the other ROG displays. Typical of the series it the matte-gray death star pattern on the back and the extravagant stand it comes on which projects a red logo onto the table surface. It comes with two gels with different Asus logos as well as three blank ones that you can customize with your own logo creations. A nice gimmick. Like many other monitors, the panel of the PG258Q can be tilted down by around 5°and up by about 20°. It can be adjusted in height by around 12 cm and tilted by 90° horizontally. Vertically, the pivet-function allows it to be tilted around the base by around 50°. For those needing even more flexibility it can easily be mounted to a 100 x 100 Vesa-mount. In terms of ergonomics, this monitor leaves nothing to be desired. With one DisplayPort (1.2) and one HDMI 1.4 port, the monitor does not offer too much in terms of connectivity. But then you don’t really need any more ports nowadays. G-Sync needs DisplayPort anyway. Those who want or need to use another connector should consider cheaper alternatives. Audio signals are fed to the monitor via DP or HDMI and can be passed through to headphones or external speakers connected to the display since it doesn’t come with internal speakers. These also aren’t needed in a gaming model since the lackluster sounds of tiny integrated speakers won’t exactly impress any gamer. Pretty much everybody is going to use their own sound system, anyway. On top of the video connectors, the Asus monitor has two USB 3.0 ports on the back. A cable for connecting the monitor to your computer’s USB ports is included. With HDMI and DP cables, and the power supply included, the contents of the box are pretty much all you could ask for. Cable management in the ROG models is second to none: All ports are hidden behind a door and the cables are fed through a hole in the socket. ULMB (Ultra Low Motion Blur): This is a technology developed by Nvidia where black frames are inserted after every other frame. This reduces ghosting and makes on-screen motion feel sharper. Sadly, this feature cannot be used while G-Sync is enabled, and only works at 85, 100, or 120 Hz. So, for the PQ258Q, G-Sync or a fixed 240 Hz are the better options. Other manufacturers call this feature “Black Frame Insertion” (BFI) or Benq’s “Dynamic Accuracy” (DyAc) which, however, isn’t a feature present on the 240 Hz Zowie model. OD (Overdrive): By “overdriving” the liquid crystals in the display panel reaction time can be shortened, thus also reducing ghosting. However, the higher the voltage fed to the pixels, the more pronounced to so called “Corona Effect” becomes – a bright shadow occurring during sudden motion. One con is thus being replaced with another. Because of this, the Overdrive effect can be fine=tuned in the menus to let you find the ideal compromise between motion blur and the Corona Effect. Most times, the moderate setting seems to be the one worth going for – same is true in the PG258Q. It offers the settings “OFF”, “Normal” and “Extreme” for this feature. Dark Boost: This is a technique that brightens dark areas onscreen without increasing overall brightness or gamma. This comes in handy for games with a lot of dark areas or high-contrast environments. First of all, it is worth mentioning that TN-panel technology has improved significantly over the last couple of years, and it isn’t just something used in cheap monitors anymore. Instead, TN panels make more sense for gaming oriented monitors since their reaction time is much faster than that of IPS panels. Combines with image quality that doesn’t have to hide behind the competition, making the compromise in order to get a “fast” display panel doesn’t necessarily feel like a compromise anymore. With almost any panel you’ll find a contrast ratio of 1.000:1 in the specs. Many mid-price models come in just short of that. In our test however, the Asus has even surpassed this benchmark. It’s maximum brightness of 490 cd/m² is far above average – you’ll almost need sunglasses to look at it. Even for bright environments, 300 cd/m² would’ve been enough. In the real world, we seldom had the brightness set higher than 250 cd/m². Even at maximum brightness, the blacks are still dark enough at 0,5 cd/m². 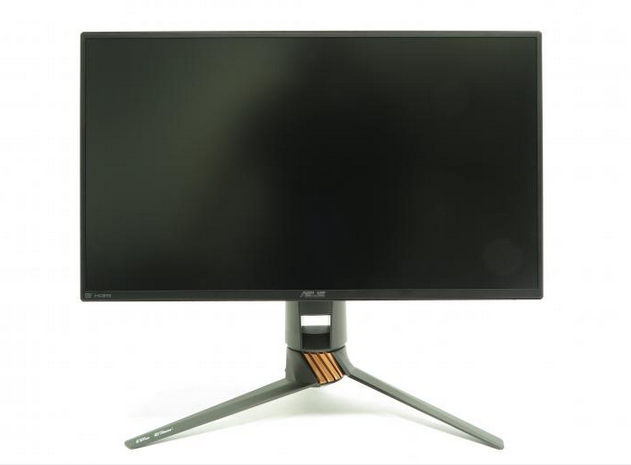 While usually IPS-panels have the edge over TN models in terms of color accuracy, this monitor’s average Delta-E of 4,4 would even be considered great in an IPS panel. It’s also important to say that the PG258Q also achieves this measurement in other modes beside the SRGB setting which in most monitors is their only means of achieving a color-accuracy reading this high. Despite the almost ridiculous level of backlight-power, the panel is being illuminated pretty evenly. We could measure differences in luminance of 9% or less in the upper third of the screen. Differences of this magnitude cannot be perceived by the human eye. In the bottom half of the screen, the deviations are even smaller at 0-3%. Again, a terrific result for a TN-panel. Ghosting? Well, 240 Hz! That means: They are pretty much nonexistent. Combine this refresh-rate with the medium overdrive-setting and all noticeable ghosting is pretty much gone. If, for some reason, you’re still spotting sync issues here (for the record, we couldn’t), just activate G-Sync. With the refresh-rate synced with the framerate, these issues are a thing of the past. We measured the input lag using a small device developed by British engineer Leo Bodnar that is limited to a single HDMI input. It told us that the delay clocks in at 15,9ms. The shortest input-lag we were able to measure was between 9 and 10ms. It’s important to note that we had displays in for a test that had input-lag of around 25ms. Our results gained by using the Bodnar however, are an orientation figure at best, as are the CRT direct comparison measurements. Since even those have their advantages and disadvantages, they can’t be compared. It’s only natural that the first reaction to seeing Full-HD TN-panel monitor being released in 2017 at over 600€ is dismay. But another panel-technology or higher resolutions are simple not yet possible in 240 Hz displays. At least not for an affordable price. 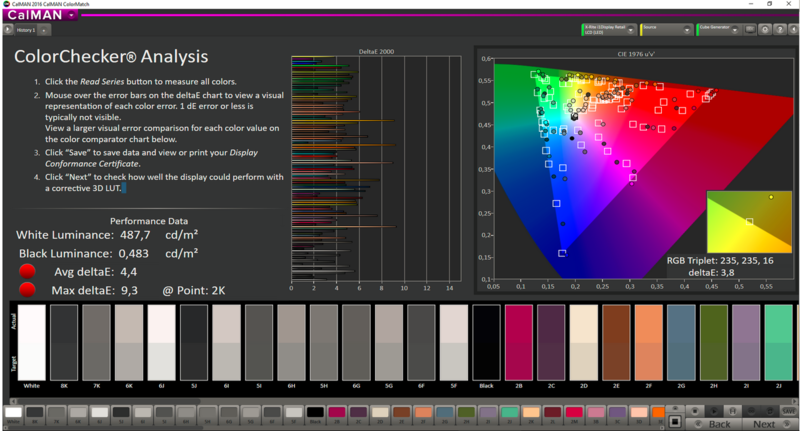 Also, the PG258Q is a testament to the quality of TN-panels that has improved drastically. The gap between TN-panels and the mid-level IPS displays is getting narrower. In addition to that, having G-Sync in a monitor alone adds around 150€ to the price-tag. Even with IPS or the first Quantum-Dot (QLED) displays delivering a crisper and more detailed image with each new model, TN stays unrivaled when it comes to reaction-times. For high-FPS gaming, for example in Counter Strike, this is more important than outstanding color-accuracy or greater contrast. Since G-Sync or Freesync aren’t really necessary here, the high refresh-rate of 240Hz eliminates sync-issues to a great degree. The G-Sync module integrated in this display thus can be seen more as an alternative to a static high refresh-rate. For example, when not playing E-Sports on a competitive level, and the incredibly low input lag resulting from G-Sync are not an issue. The Asus PG258Q thus is a great choice when you want your monitor to be able to do both. Those of you who are perfectly happy with 144 Hz, have more options in terms of higher-resolution IPS or VA/QLED monitors with higher image quality. This compromise however, is a lot more expensive. I want to add that your input lag tests probably isn’t accurate to most users. Your test using the HDMI input means that you only could do the input lag test in 60hz. Using the HDMI on this display forces it to 60Hz. In order to test input lag with any refresh rate above 60Hz(like native 240Hz), Gsync etc, you need to do the test using the displayport.